Clerics have always been a problem with the groups I've gamed with. I really like your idea of breaking the clerics into three groups. 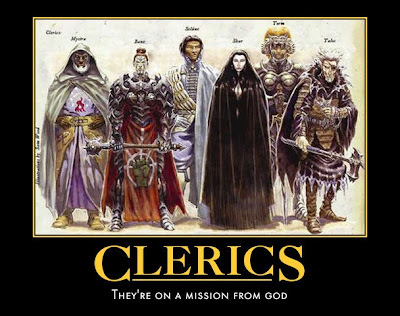 The PC can play either cleric one, or cleric two, and it'd be easy to do with some basic rules behind it. A houserule set of deities, or perhaps a deity created by the character and the DM, could be used as the guidelines. It'd be great for a basic game. That's a very interesting point about cleric characters and kids, that could be really thorny. In general, I prefer my games cleric-less anyway (cleric & magic user spells merged), and I've not run games for kids before. Great point (about kids as clerics) not something I've ever considered before. I guess it goes without saying that kids realise the difference between real life and the make-believe world of D&D. They learn quickly enough that if they pray to god for a bicycle they may (indirectly) or may not get one. I'd say let them play clerics if they want to, it's certainly not how clerics in this world operate (do thieves in our world work like theirs? nope they wait til you go on holiday, trash the place and crap on the carpet, not exactly sneaky). What I've always found hard to fathom is the link between clerics and healing. I can understand the turn undead/anti-evil aspect (the exorcist springs to mind). But the curing people with prayers always seems a little out of place to me. Are physicians such a 'modern' concept that they don't fit in to the pseudo-medieval world that D&D is largely represented as? Someone (I think it was Grognardia, I may be mistaken, sorry, nappy head) did a post on alchemist class the other day. To my mind that seems a much more suitable role for a 'healer'. 3rd/4th level are granted by a deities lesser servants. 5th+ are granted by the cleric's deity/proxy. Low level clerics are literally motes in their gods eye and beneath notice. Only when 3rd/4th level spells start being granted there is a remote chance 1% per level the VERY BUSY divine agent might aid the cleric in a minor way. This has worked in more or less all the campaigns I've ever played in. I did like the efficacy of cures at different levels for believers/non believers, it has to be said. "if clerics can pray for divine intervention, why can't everyone?" I'm actually inclined to say "sure!" 1st-level Fighters, Magic-Users and Clerics all have the same chance to hit, so why not give them all the ability to pray, as long as they're faithful followers? I'd treat it as a reaction roll on behalf of the divine powers; ordinary people get their prayers answered on a Good reaction; spell level and frequency of requests are penalties to the roll, recent acts of devotion and degree of faithfulness are bonuses. Clerics get what they pray for unless they have fallen from grace (angered the god(s) on their last request.) They also get a bonus based on their level. Are you there God? It's me Frodo. I never have seen this as a problem other than that annoying line in Deities & Demigods that allows 1st level fighters to call on Sif. I've always looked at a cleric's spells as them beseeching their deity. As they gain levels, their deity allows them to perform greater miracles. Given that the system avoids an omniscient deity in most play. I've never seen it as a problem.